Throughout Pennsylvania, large regions are working together to drive strategic investment and actions around sustainability, conservation, community revitalization, and recreational projects. Known as conservation landscapes, these collaborations are developing in key landscapes where there are strong natural assets, local readiness and buy-in, and state-level investment support. Several state agencies, local governments, funders and non-profits have worked strategically and collaboratively on the ground for several years in seven landscapes to develop this value-driven, place-based approach to land conservation and community economic revitalization efforts. Download the map of all seven conservation landscapes. 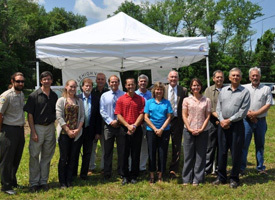 The Department of Conservation and Natural Resources (DCNR) oversees the conservation landscape program. Each of the existing seven conservation landscapes is coordinated by a DCNR “internal lead” employee and an “external lead” from a local organization. For Lehigh Valley Greenways, the local organization helping to lead the partnership is Delaware & Lehigh National Heritage Corridor (D&L). 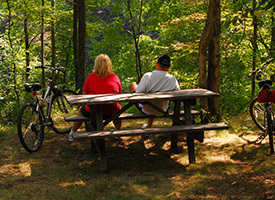 In 2004, when DCNR was launching the Conservation Landscape initiative (now a program in its second decade), DCNR Secretary Michael DiBerardinis was inspired by the established connection between state-owned Jacobsburg Environmental Education Center and the volunteer-based Bushkill Stream Conservancy to combine conservation and recreation through public-private partnership. This inspiration helped Lehigh Valley Greenways become one of the first two Conservation Landscapes designated; the other was Pennsylvania Wilds.